As one of the card's brand ambassador, Rachel Brosnhan was on hand to promote the American Express Cash Magnet Card yesterday(November 26th) at Haven`s Kitchen in New York. 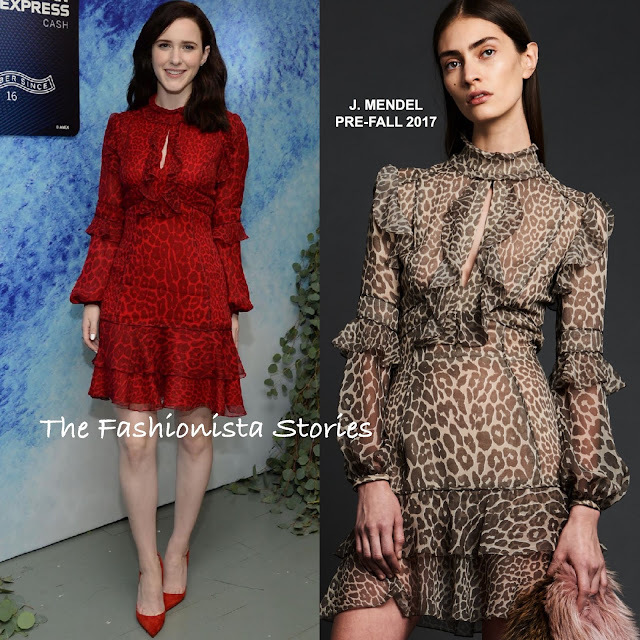 She posed for pictures wearing a J. MENDEL PRE-FALL 2017 long sleeve red leopard ruffle printed mini dress, featuring a mock neckline, a key-hole bodice and tier mini skirt. The dress was shown in a neutral, brown hue in the look book but I prefer Rachel's red hue. Matching her red CHRISTIAN LOUBOUTIN pumps with her dress, she finished up with light makeup and side parted tresses.